Now there are well, I think scientist don't know how many galaxies, but many many galaxies and it's just so vast and so great that the human mind will hardly conceive it, but God is so great that He created everything, created all that and He created it for a purpose and He created it to be used and yet these planets have never been used. Well as I said this earth was the proving ground for the angels then and is the proving ground for man now, to learn how to be a creator with God and to have our part in it. I think that most people think that when God created the earth that it was created complete and perfect in every way. Now your half right as far as it was created it was perfect God never creates anything imperfect, but when God created man, let me give you an example, when God first created man He only created the physical man and that was not a finished creation. After that must come the spiritual creation and the real purpose of God was to produce or reproduce His own self and instill within man His holy and righteous character. Now God set before the angels for example His own way, His own truth but, they didn't follow it. God set before Adam the first man His way and His purpose in man and what man's ultimate and fantastic potential really is, but Adam had to resist Satan and he didn't do it he rejected God. Well I'm coming to that a little later, but God first put angels on this earth very few people realize that. That before man angels had inhabited this earth, but as you'll read in the 2 Peter 2:4; the angels sinned. However when He created the earth the angels shouted for joy because it was to be their home and it was beautiful as far as it went, but as I said it was not complete and just as in man. Man was complete as a physical being but the spiritual creation is still going on in human beings, at least in a few, but God intended the angels to work the materials in the earth to improve to beautify the earth and to have their part in the creative process by finishing what God had created as far as it went. Now I might say while I am at it He intended man to do the same thing and we have not done it, what has man done to this earth? We have polluted everything that man's hand has been able to touch. Everything of God's creation that we have touched we have polluted the atmosphere of the air. We have polluted the waters of the rivers and the lakes and the seas and the oceans. We have polluted the soil that produces the food we eat. We have degenerated everything that God has let us have anything to do with when He intended us to improve it, but as I said the angels rejected the government of God. They became resentful and so they rebelled and as a result the government of God was no longer being administrated or observed on the earth. Now God had set on the throne of the earth over the angels a super arch angel named Lucifer, I've mentioned this time and again in preceding programs. Now his original name Lucifer means shining star of the dawn. It means one who brings light and truth, but instead of bringing light and truth which God had given him. He fed his angels on just the opposite. On resentment and bitterness and on rebellion and so there was a rebellion as a result of that. Something that I know that God has revealed and that I imagine that there isn't one person in ten million that knows or understands all of the planets like our planet, like our moon, like the planets of our solar system, like Mars, Jupiter, Saturn and so on have gone into a state of decay. Now decay is not an original created state. Decay is something that has had to happen by deterioration. It takes time to produce decay so it is not the way God created originally. I knew that if we ever got cameras down on one of these planets what we would find and what did we see just the same thing as we have on the moon. Everything is waste and empty. Everything is degenerated. Everything is decayed. Now it could not be the state in which God originally created it and I don't know whether your mind ever dwelt on things like this but mine does. I want to know all I can know about God and about the things He has done. How did these planets become decayed? It is not an original created state, can't be. There is no way at all to explain it except that the angels were put here to qualify, as the proving ground to qualify for them if they would work this earth an improve it and finish it and beautify it. That they would go to other planets all over the entire vast universe. So now God set out on the most marvelous creative feat of all, to reproduce Himself and to reproduce Himself with the idea of inculcating in humans. That He would make His own perfect, holy, righteous character so that we then could go and do what the angels had failed to do and what they might have done and I have shown you on other programs that the almost incredible unbelievable potential for human beings is that we are to finish the creation of planets all over the vast universe. So vast you can't conceive it, but the first purpose of God in man is the creation of Holy and Righteous character and that must come from God, but it must come with our own decision and of our free will and we must make that decision. Well now chaos and decay had come to the earth, but if you turn to the 104 Psalm and I mentioned this quiet often, where in the 30 verse the psalmist writes of God (Psalms 104:30), "Thou sendest forth thy Spirit" that is the Holy Spirit God sends forth; "they are created and thou renewest the face of the earth." God renews the face of the earth. He renewed it after it had been deteriorated as a result of the sins of the angels. Now in 6 days God renewed the face of the earth and created man upon it. Man was created in the very image of God. He created animals each after its own kind, cattle after the cattle kind, dogs after the dog kind, but "He said, let US make man in our image after our likeness" (Genesis 1:26-27). In other words, let us make man after the God kind. Man was made to have a special relationship with God that animals cannot have. But now since this earth had a ruler. Who now became Satan, his name had been Lucifer, and now his name has changed to Satan which is rival or enemy or adversary. It was necessary for the man that God created whose name was Adam to resist this way of this Satan. To turn from it as well as to accept the way of the government of God before he could be used or qualify to take over that throne and to restore the government of God on this earth which had been here over the angels. But Adam said in effect, well now look God, I've heard what you've had to say. I'll listen to you first and I know you didn't let Satan even come to me until after you talked to me. You explained to me all about your way and about your government and so on and I know it's my wife that listened to Satan first but I listened also and I have decided that I want you to keep your nose out of affairs God. I will make my own mind up of what I think is right and what is wrong. I will decide what is righteousness and what is sin. I will decide what kind of god I want to worship. I know you are my creator but I reject you as my God. I reject you as the basic source of revealed knowledge, and God said well you have made the decision Adam. And therefore it is your decision not mine and I sentenced you and those that'll come from you will be, entire human family, to 6,000 years of being cut off from me. For 6,000 years you will have no access to Me or my Spirit, My Holy Spirit which could inculcate in you My divine nature which could inculcate in you My righteousness and My Holy and righteous character. You have rejected Me and I now pronounce that sentence upon you and upon the whole world for 6,000 years and listen my friends that 6,000 years is not yet quit up it almost is, we're in the last generation of it, just think of that. Now Adam had failed and there could be no one could qualify now till the second Adam came and did qualify to conquer Satan, to resist Satan to except Gods way and to restore the government of God on this earth. Now the human mind is hostile against God. I haven't time to explain everything about it now, but the human mind has within it a spirit that is not the man. It's no part of the man himself it's just in the man. It is not a soul. It's in the soul, the man is the soul, the whole man made out of the dust of the ground and in Genesis 2:7 you'll find that "God formed man of the dust of the ground and breathed in his nostrils the breath of life and man" [from the dust of the ground] "became a living soul". So the dust of the ground became a living soul and the soul is not a spirit. Now that shows you how the world has been so deceived this 6,000 years. That's part one of the very central parts of the great deception that has come, but the human mind is one spirit that I call human spirit for one of a better word. It's not human really it's inhuman but that empowers the physical brain with intellect. Now that spirit cannot see it, can't hear it, can't think. The mind or the brain of each human sees through the eye and hears through the ear and does the thinking and builds the character good, bad or indifferent however it may be. The spirit records it and the spirit acts as a computer and gives instant recall to the brain so that the human physical brain has that instant recall of every bit of knowledge that is entered and is remembered and can use that in the thinking process, so man thinks and man reasons and man has the ability to even think creatively and constructively. However, the natural man is limited to what the eye can see the ear hear or what he can feel or touch or smell or taste. Now you cannot see spirit you can't hear spirit it doesn't vibrate you cannot touch or feel spirit and so (I Corinthians 2:14) "the natural mind of man cannot know the things of God and they are" [as the Bible says] "foolishness to the natural man". Without the spirit that is in man so no man even with that spirit can know the things of God without the Holy Spirit of God in other words he needs a second spirit. Now again I said man's creation was not complete. Man was given that one spirit that gives him that carnal natural mind, but he needs another spirit to give him the spiritual mind and with which he can build spiritual character and that's what we are put here for. Now you haven't heard this before, I mean you haven't heard anybody else preach this thing. So was born Jesus, the second Adam, and He was coming to restore the government of God. He was coming to save the people and to make possible this holy and righteous character. Now I would like to have turn to (Matthew 1:20); "...behold the angel of the eternal appeared unto him in a dream, saying Joseph, thou son of David, fear not to take unto thee Mary thy wife: for that which is conceived of her is of the Holy Spirit". Joseph was going to put her away because he found she was pregnant and he supposed it was from some other man and he didn't know any better but now the angel is explaining to him that this was a very holy thing coming from God and the Holy Spirit of God. (Matthew 1:21-23) "And she shall bring forth a son, and shall call His name Jesus: for He shall save His people from their sins." "Now all this was done, that it might be fulfilled which spoken of the Lord by the prophet saying, Behold, a virgin shall conceive. A virgin shall be with child and shall bring forth a son, they shall call his name Emmanuel, which being interrupted is, God with us." That was the prophesy of Jesus coming as the Savior. Now Jesus was both a savior and ruler so He was born also to be a ruler. Now then we might now turn for a moment over to Luke. In the first chapter of Luke (Luke 1:32:33; "...and the Lord God shall give unto Him the throne of His father David: and He shall reign over the house of Jacob forever." Jesus was born to be a king; you don't hear that very much. You only hear of Jesus and of His shed blood saving us from our sin and His shed blood does not save us. Now what do you think of that? A lot of people are going to say well that man Armstrong must be some kind of a nut and he must be wrong. Surely we're saved by the blood of Christ. No we're not. Turn to the fifth chapter of Romans and read it , by the blood of Christ, the death of Christ (Romans 5:10); "...we are reconciled to God" and given a contact with God which we'd been cut off from since Adam but "we shall be saved" [it says by His resurrection], "by His life" [not by His death]. Death can't produce life. We ought to get these things straight. Very few do have the Bible straight they've got it twisted like everything else. So was born Jesus the second Adam. Satan tried to destroy Him as an infant (Matthew 2:14, 16), as a child but God saved Him, had His parents take Him down into Egypt for a little while until King Herod was dead who had sent out the decree that all the children under two years of age were to be killed. Now we come to (Luke 2:40) and it says here that; "the child grew, and waxed strong in spirit, filled with wisdom; and the grace of God was upon Him". Now remember that He was born of God as no other human being had ever been. He was the Word that had existed with God. He was the one by whom and through whom God had created all things (Ephesians 3:9). As you read in Ephesians the third chapter; "God created all things by Jesus Christ". So now He gave all that up, He divested Himself of all that wonderful glory that He had had and came to be born as an ordinary child to grow up with Satan trying to have Him killed. With people even spitting in His face, people insulting Him, people giving Him every kind of persecution that could be heaped on a human being, but being God He was able to resist Satan and He never once sinned. 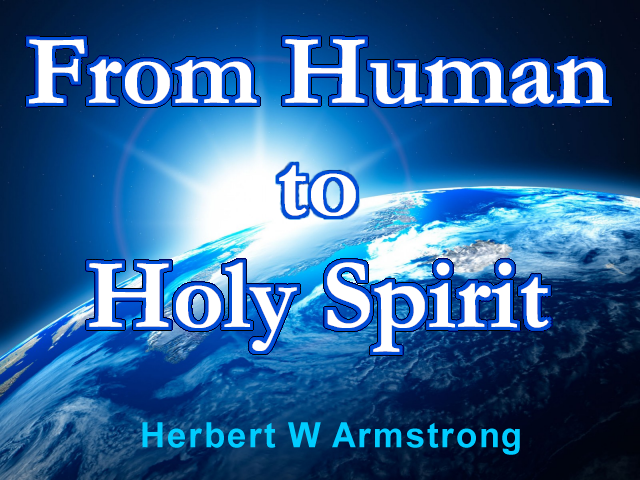 Now Satan was getting after Him the same as he does everybody and trying to through the spirit within Him, but He also had the Holy Spirit of God as well as the human spirit. Jesus Christ was born to restore the government of God on this earth. Now then the first Adam had to make a choice. You know that Jesus Christ had to make a choice too. Jesus Christ had to make a decision of whether He would go the way of God or whether He would go the way of Satan and Satan was allowed to come to Him and to tempt Him but then now we might turn back to (Mark 1:9-12); "And it came to pass in these days, that Jesus" [now Jesus was about thirty years of age at this time, it was before He preached a word] "that Jesus came from Nazareth of Galilee, and was baptized of John in Jordan", the river Jordan, "and straight way coming up out of the water, He saw the heavens opened, and the Spirit like a dove descending upon Him." The Spirit of God "and there came a voice from heaven saying, Thou art My beloved son in whom I am well pleased. And immediately the Spirit driveth Him into the wilderness". "And then for forty days and forty nights He fasted". Not a drop of water not a morsel of food for forty days and forty nights and then Satan appeared to Him and says now, "If you are the son of God." See that's a challenge. The average person, what do you mean "if I'm the son of God"? I'll show you that I am, but not Jesus. That's what maybe you or I would do. He said if you're the son of God, you turn these stones into bread just do perform a miracle and start to eat because you are hungry. He said no. He said (Matthew 4:4), "...Man shall not live by bread alone, but by every word that proceedeth out of the mouth of God." Well Satan gave Him three of the most severe temptations that could come to a man. There in that temptation by Satan after fasting forty days and forty nights was the most titanic battle that has ever been fought in all the wars and battles we have any record of in human history. Jesus Christ at that time qualified. He overcame and conquered Satan. Finally He gave the order and said, "Satan you obey Me get out of here," and Satan did get out of there. He qualified to set up and restore the government of God and set up the kingdom of God. Now He qualified where the first Adam had failed. "Now after that John was put into prison" versus 14 "Jesus came into Galilee, preaching the gospel" and the word gospel means good news "of the kingdom of God." (Mark 1:14) Now the kingdom of God is not yet come He was telling what was going to happen. It was a prophesy of how God was going to set up the kingdom of God. Now the kingdom of God is more than restoring the government of God because the kingdom of God is the divine family of God those born into that family until they become God as much God as God the Father is only not with as much power, not as much authority and it is then the family of God ruling in the government of God over the whole earth and later to rule over the whole universe. That is the fantastic almost unbelievable potential of every one of us and yet men aren't interested in that. The average man the average person says look don't bother me about that I'm just interested in whatever little television show I'm looking at the moment or whatever baseball of football game or whatever and just don't disturb me, I just want to be comfortable and go on and enjoy myself. I can't understand it, I can't. People aren't interested in knowing why they're here. Why did God put us on this earth? Most people aren't interested in those things. Jesus had qualified and now He went out to proclaim the good news of the coming kingdom of God. That was a prophesy He was only announcing what is going to happen. Now He wasn't trying to get people to agree with Him. He didn't require that anybody agree. He wasn't trying to convert people. Jesus Christ did not come on a soul saving crusade. Let me repeat that because you have been taught that He did. Jesus Christ did not come on a soul saving crusade. He came to announce of what God was going to do and you don't have to agree with it at all. It's going to happen anyway. As a matter of fact the world is going to fight against it. People aren't going to choose it. It doesn't make any difference this is what God is going to do. He's going to restore the kingdom and the government of God on the earth and set up the kingdom of God and there's no way that Satan and all of the people on earth or anybody else can stop it.